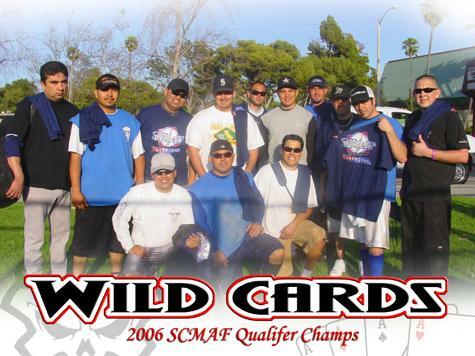 Welcome to the Official site of the Oxnard Wild Cards. Formerly known as La Costa Plumbing, Last out Buys, and Just For Fun. Started off as a decent team, back in the late 90's. 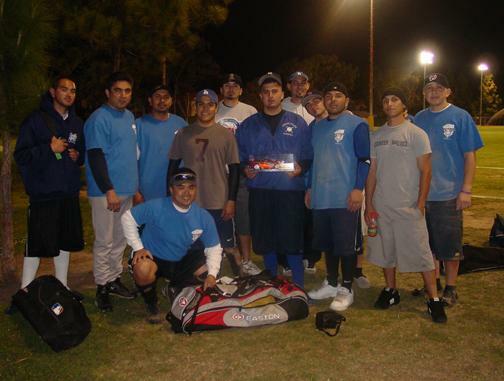 It was more a fun team that started in the lowest REC league in Oxnard. Won 1 SCMAF Qualifer tourney back in 2000. Slowing becoming an up and coming team. However, the team went rock bottom between 2000 to 2004 losing to every team in Oxnard. 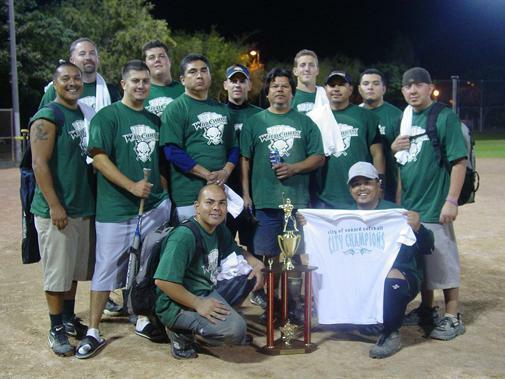 Started to come back strong in early 2005, winning the Rec league and our first City Championship (Rec Division). After a bunch of stupid team names from Lorenzo, his wife finally came up with a good name that identified us and it was the Wild Cards. 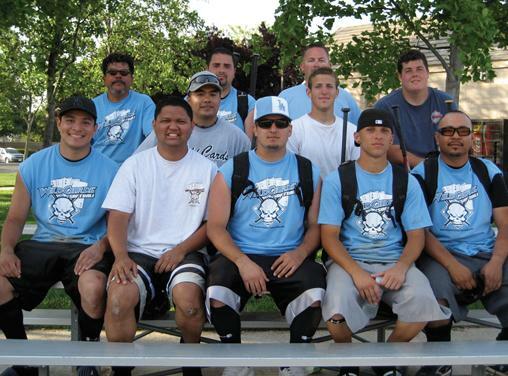 The Wild Cards started placing 3rd or 4th place in leagues and in tourneys but with a horrible manager (Lorenzo Garcia) and dead beat players who had attitudes, kept the whole team from having a successful year. Too many finger pointing, no shows and a bad manager who can't keep organized and order within the team. But with the team manager, Lorenzo Garcia leaving his team mates and not telling anybody, Virgil Tomas took over as the new manager, player, stat keeper, website designer and graphic designer, cleaned house in 2006. Dumped all the over-rated flakey players who had bad attitudes and replaced them with a few young exciting players who were down to play. With new players and great attitudes on the team, they won their league title in April 2006, placed 3rd in the City Championship in the Upper division and started winning a lot of tourneys since then. The Wild Card team is built by character and talent. Gone are the negative vibes from the old manager and the other players who were on this team before. This team now has speed, power and finesse. A well organized team who are ready to Crank It Up against any team that challenges them. We will win most of our games as well as lose some of them. Nonetheless, we learn from our mistakes and be the best we can. We work hard together as team. No arguments from one another. We have a goal, win as a team, lose as a team. Join us for the ride!!! Enjoy!! 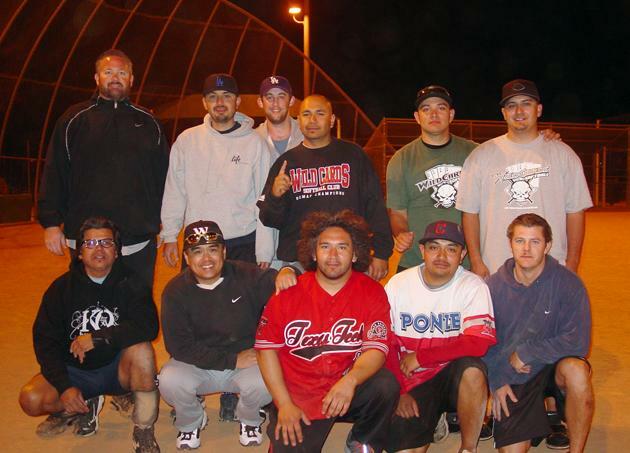 Wild Cards finished their 2008 Softball Season by winning their Thursday Night Men's Fall League. They went 9-1 and defeated the Summer League Champs Solomon Plumbing 21-19 in their last game of the season. 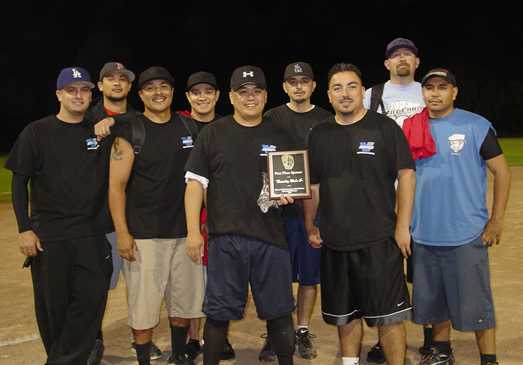 VORTECH ENGINEERING (Wild Cards) enjoy Spring Season by winning 9 out of 10 games. As always City Of Oxnard seems to be slow once again. 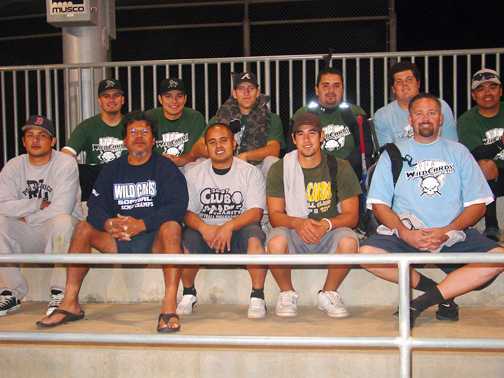 Like the 2007 Summer League City Championships, Its been a awhile that the Wild Cards haven't played in Oxnard since they played their last league game in Oxnard, November 15th. Not one month, but 2 months later later, Wild Cards bring their so-so 6-5 record to the Big Dance against 8 of the toughest teams in Oxnard. 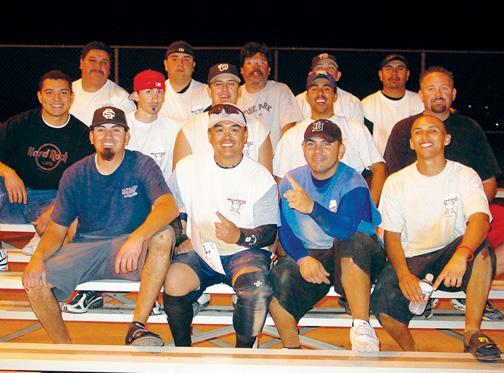 First team to win 3 straight games are Oxnard City Champions for Winter 2007. 2007 Winter City Playoffs, this where they wanted to be, it was real cold and windy and made it hard from them to warm up. Especially being ranked as the last(8th) seed. Their first game they were down 16-4 after 5 innings against the #1 seed, Rico's Chiropractor. Wild Cards struggled and they were just ready to give up. However in the 6th inning, I don't know if it were the softball gods but the wind picked up very strong and they got off the floor. All of a sudden they were fired up at that point and just kept hitting and walking and bashing the sh#! of the ball. With the late inning comeback, the Wild Cards managed to survive and hold on for the 19-18 win. It was the greatest comeback ever for the Wild Cards!! On to the semi-finals. 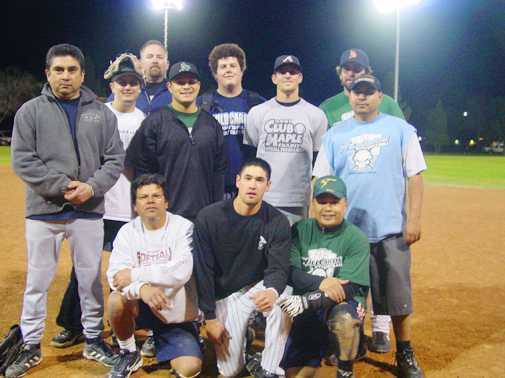 Another top seeded team, No Chance (8-2) from the Wednesday Night REC 1 Division. No Chance tried to make it a game, but too many mental mistakes and errors made it impossible to overcome the now red hot Wild Cards. For the first 6 innings it wasn’t a close game. Wild Cards took a huge 15-7 lead and never relinquished the lead. Wild Cards wins 22-10 . Congratulations to the 2008 Fall/Winter League and Oxnard City E/Novice champions! 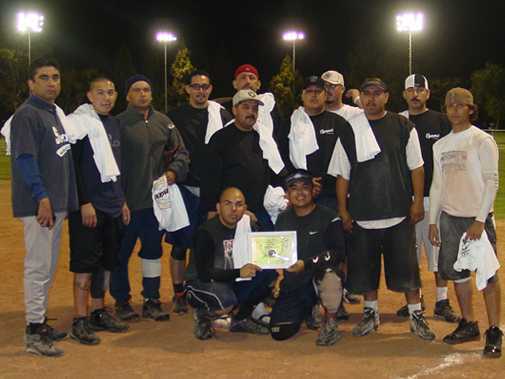 After coming in 2nd and 3rd place and falling short of 2 City Championships in the the past 4 seasons, the Wild Cards finally became the first REC team in 2007 to go a perfect 10-0 in league and 2-0 in the Oxnard City REC League Championships. 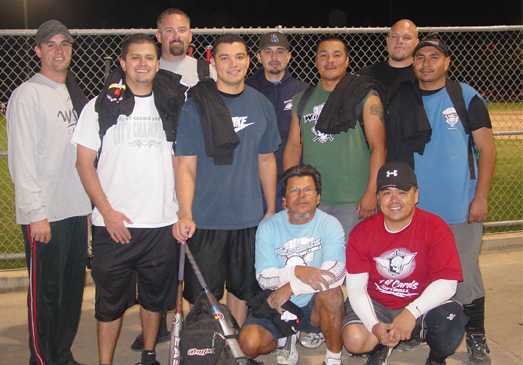 It was a long hard fought struggle, for the Wild Cards but they were finally rewarded as they achieved the greatest accomplishment in 2007 -- to go undefeated 12-0 and win it all. Not many teams can accomplish this feat as any team can win on any given day. Even with a stacked team, it is very difficult to do. However the Wild Card players and their fans, stuck together as a team and overcame the toughest opponents. Congratulations to the 2007 Summer League and Oxnard City REC champions! Wild Cards dominated and went undefeated (5-0)in the Spring Classic Divisional, by Outscoring the opposition 93-35 and keeping them to less than 8 runs. 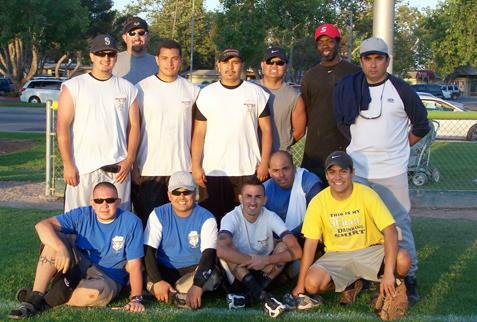 2006 Oxnard SCMAF Tourney MVP, Virgil Tomas and the Wildcards destroyed the competition in the Semi Finals and the Championship game by the combine score of 51-15. 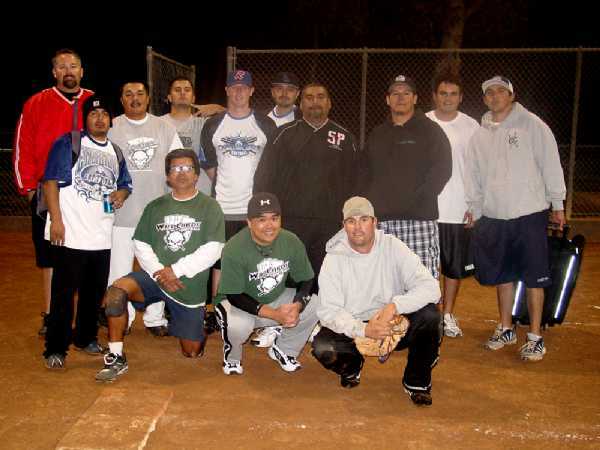 Welcome to the Official Site of the 2005 Oxnard softball Beginning REC Division League Champs and the 2005 City of Oxnard - City Beginning REC Division Softball Champs.